Chopped salads of all kinds are always a huge hit, and this one certainly delivers as well! 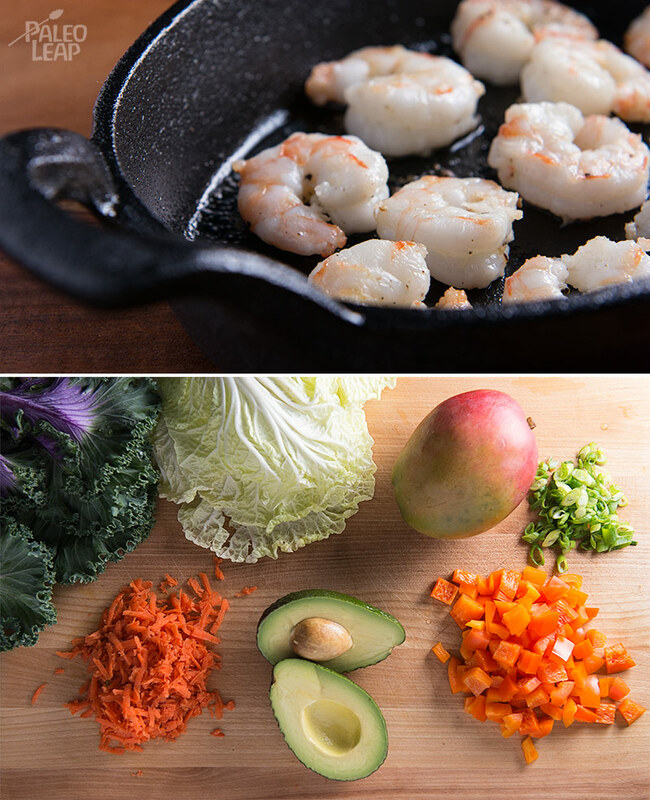 Packed with highly nutritious ingredients like purple kale, Napa cabbage, shrimp, avocado and bell pepper, it’s an easy way to experience what Paleo is all about and to get back to the basics with your diet. We decided to top this salad with a creamy coconut curry dressing. The dressing has a nice kick to it and adds a nice portion of healthy fats from the coconut milk. We also found that the mango in the salad contrasts especially well with the dressing. Or course, if you’re not a fan of curry spices, you can always substitute with any other homemade dressing. This almond dressing and this spicy dressing are two great options. Enjoy this refreshing salad outside on a warm sunny day, or have it at work by bringing some of the dressing in a separate airtight container. SERVES: 4 PREP: 25 min. COOK: 4 min. Whisk all of the ingredients for the dressing into a medium bowl. Taste and adjust the seasoning if desired. Place the dressing in the refrigerator while prepping the rest of the salad. 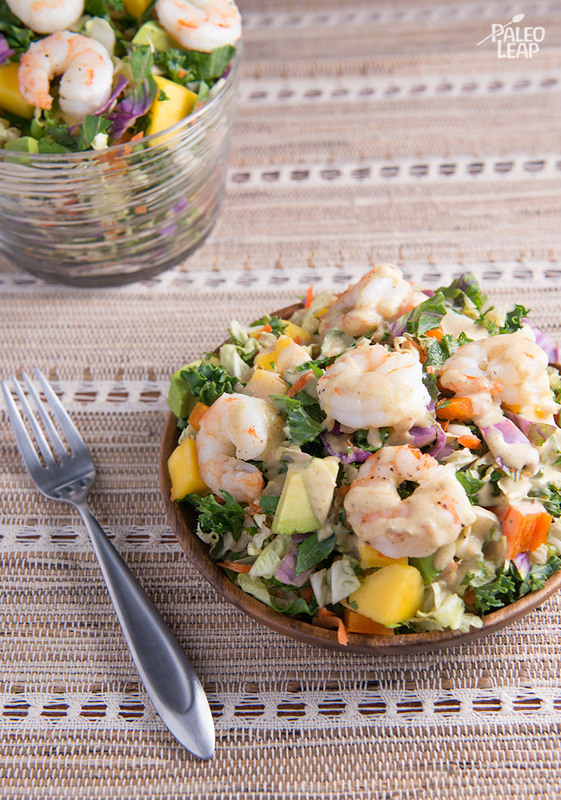 In a large salad bowl, combine the kale, cabbage, carrot, bell pepper, avocado, mango, green onion, and cilantro. Toss to mix well and set aside. Heat a large skillet with the ghee or coconut oil over a medium-high heat. Season the shrimp with salt and pepper and add shrimp to the skillet. Cook 1.5 – 2 minutes on each side or until the shrimp are opaque in the center. Place top shrimp on top of the salad, drizzle with the desired amount of dressing and serve.